Job requirements can vary significantly leading to incorrect assumptions when using management assessments that are not job specific. For example, technical management has different behavioural requirements than customer service management or sales management positions. To be accurate, management assessment should be specific to the requirements of the specific management position. More than 600 variations of Management Assessments are available which are based on 30+ years of research. Each management assessment typically measures 10 essential success factors as well as 40 potential derailers. It provides managers with key insights they need to stay on track. Our SmartQuestionnaire measures 175 talent factors in only 25 minutes. When a specific management position is selected, our management assessments compare the individual's behaviours to proven management success behaviours for that specific position. 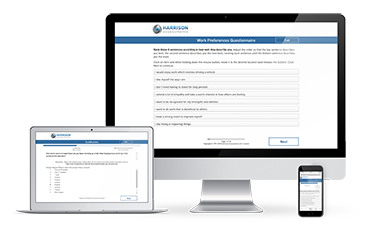 Harrison Paradox Technology provides a new depth in management assessment by analysing the paradoxical balances needed to succeed for a specific position. For example, being willing to make decisions is an important factor for most management positions (depending upon the level of authority). However, if it is not balanced with the tendencies to invite collaboration, the manager will fail to tap the collective wisdom of the group. On the other hand, manager's need to take responsibility to make tough decisions even when others disagree. Achieving paradoxical balance is the key to management success.